The Rock n Roll Cowboys will present their first-ever Estes Park, Colorado concert on Saturday, July 23 at the National Park Village Playhouse. The band specializes classic country/rock favorites with hits by Lynyrd Skynyrd, Eagles, Charlie Daniels Band and much more. Band members include Brad Fitch, Mark Rashid, Kevin Dennis and Jeff Kennison. Their shared love for the music that pioneered today’s modern country is contagious and they guarantee a fun-filled, rockin’ time for all. Doors open at 6 pm with show time at 7 pm. The National Park Village Playhouse is located at 900 Moraine Ave, behind the Country Super Market at the intersection of Mary’s Lake Road. A full bar will be available. Hailing from Estes Park, Colorado, singer/songwriter “Cowboy” Brad Fitch has been a professional musician since he was in high school. He has recorded 19 albums featuring his original music and has performed in a variety of bands and as a soloist. He is a former member of the Barleen’s Arizona and Rocky Mountain Oprys, The Elktones, Fitch and Chips, and may be best known for the campfire music programs he has presented in downtown Estes Park for the past 20 summers. 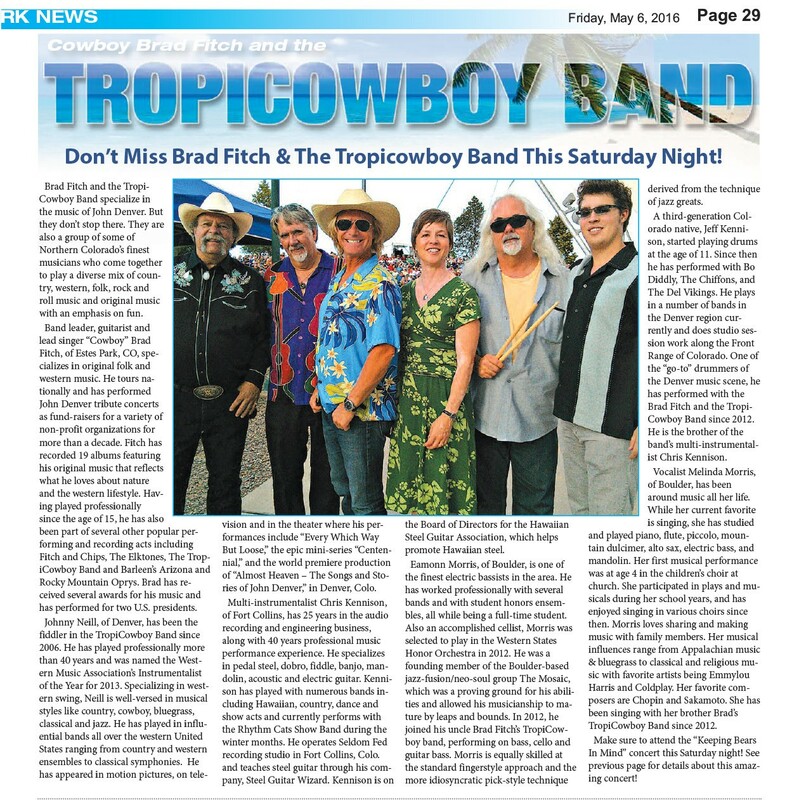 With his TropiCowboy Band, Fitch honors the musical legacy of John Denver, performing tribute concerts throughout the U.S. He is a lead vocalist and rhythm guitarist with the Rock n Roll Cowboys. When he’s not presenting his horse training clinics or writing books (he’s published more than a dozen), internationally-known horseman Mark Rashid enjoys writing and performing music. A resident of Estes Park, Rashid has performed professionally throughout the Western U.S. His former band, The Elktones, were a staple of the local Estes Park music scene for more than a decade. As he travels the world with his horse-training events, Rashid often carries along his guitar, treating participants to intimate evening concerts. Rashid can be seen playing his guitar in the movie, “Into the Wild,” for which he wrote the screenplay. He is the lead guitarist and vocalist with the Rock n Roll Cowboys. Originally from La Mesa, Calif., Kevin Dennis has been a big part of the Estes Park music scene for more than a decade. He has performed with a variety of bands in his native California as well as with local favorites the Dennis-Tobias Band and the Mountain Town Rockers. He studied music recording and production at Southwestern College, Chula Vista, and at San Diego City College, and operates his Artist Mind recording studio in Estes Park. Dennis has been a musician since he was 13 years old, playing bass, guitar and mandolin. He is also a song writer, graphic artist and web designer. He plays bass and sings harmonies with the Rock n Roll Cowboys. A third-generation Colorado native, Jeff Kennison, of Arvada, started playing drums at the age of 11. Since then he has performed with Bo Diddly, The Chiffons, the Del Vikings and a myriad of other groups. He currently plays in several bands in the Denver area and does recording studio session work along the Front Range of Colorado. Kennison owns and operates Pro Drum Studio, a full-service drum school for students of all ages and abilities. One of the “go-to” drummers of the Denver music scene, he has also performed with the Brad Fitch and the TropiCowboy Band since 2012. He is the entertaining and expert drummer with the Rock n Roll Cowboys. Colorado native Chris Kennison has 25 years in the audio recording and engineering business, along with 40 years professional music performance experience. Chris specializes in pedal steel, non-pedal steel, dobro, fiddle, banjo, mandolin, acoustic and electric guitar. Chris has played with numerous styles of bands including Hawaiian, Country, dance and show acts and currently performs with the Rhythm Cats Show Band during the winter months. Chris operates Seldom Fed recording studio in Fort Collins, Colorado and teaches steel guitar through his company, Steel Guitar Wizard. Chris is on the Board of Directors for the Hawaiian Steel Guitar Association, which helps promote Hawaiian steel. What’s it like to attend a “Cowboy Brad” Fitch performance? To sum it up in a few words – enjoyably different each evening. 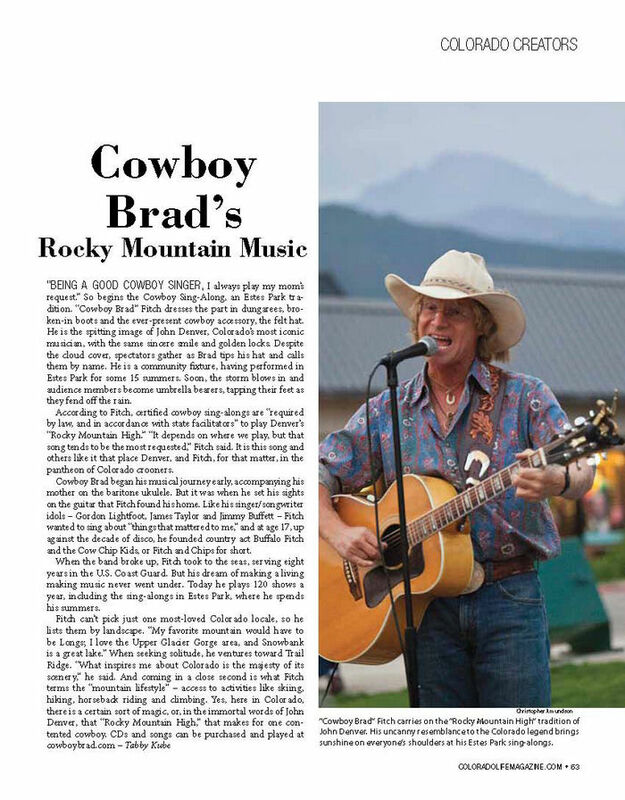 First and foremost, Brad (hailing from Estes Park, Colorado), is a great musician, singer and song writer. There are many singers who perform either their own, or others, songs without emotion or connection. That is not the case for Brad. Whether it is a song performed primarily for kids or the very contemplative songs of his or other artists, each is delivered with the reverence it deserves. This is a unique talent, not one to be taken lightly. Although many people want to say that Brad looks like John Denver, (I guess it’s the blonde hair and perhaps the glasses), Brad leaves the distinction to the audience. He makes no attempt, nor claim, to be a “look-alike, sound-alike” performer. Rather, Brad delivers to his audience his artistic interpretation of John’s music. This frees him to deliver the many songs of John Denver without any artificial bonds or limitations to the original score. (Incidentally, John Denver himself played and recorded his music a number of different ways throughout his career). John Denver tributes are a small portion of the musicality of Brad Fitch. Attend two or more of any Brad Fitch performances and you’ll hear music that spans well beyond the Continental Divide. This includes, but by no means is limited to: Gordon Lightfoot, Marty Robbins, Woody Guthrie, Steve Goodman, John Prine, John Denver, Jim Connors, Bob Dylan, Pete Seeger, Doug Fitch, Bob Bufford, and many others. You’ll hear cowboy songs, songs of the west, country, country western music and more. Attend a campfire program or house concert and you’ll be blown away by the musical repertoire immediately available for the asking! With all the wonderful music that Brad performs, there is more – much more. Brad is a highly accomplished song writer. Attend a night of all original music and you’ll enjoy an evening of talent that stretches far across the strings of his Guild guitar. Romantic ballads, songs of the sea, musical stories about life in the mountains as experienced from the top of Longs Peak, to the floods of the Big Thompson, Brad’s discography shares with us his life, his living, his love of his music, the environment, and his friendships. If you have an opportunity to see Brad perform in person, whether solo or with his full band, by all means, do so. And if you are considering employing him for your own evening performance, either as a house concert, solo performance or full band show, don’t wait too long to book him for your dates. His calendar fills quickly (as do the well-marketed venues he plays). 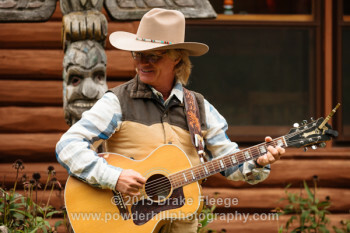 In an ongoing effort to keep the music and spirit of John Denver alive, Estes Park’s “Cowboy” Brad Fitch and The TropiCowboy Band present their 11th annual John Denver Tribute Concert, Aug. 30, at the Stanley Park Fairgrounds. High energy bluegrass band Chain Station opens the show. The concert, which always proves to be a memorable and popular event, features classic songs from the legendary Denver and benefits the Estes Park Lions Club charities. The majority of funds will go to organizations for the sight and hearing impaired, community social services and local scholarships. 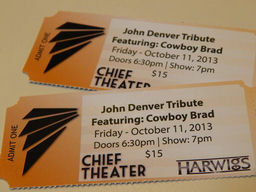 Fitch believes Denver, one of the world’s best-known and best-loved performers, would have approved of the show’s charity aspect. “This is one of the most gratifying shows that I perform, and I’m proud to keep John Denver’s music, memory and message alive through this event,” he said. Anyone familiar with Fitch’s music and performances will find this show a bit distinctive. “This concert is different because it is exclusively John Denver’s music. 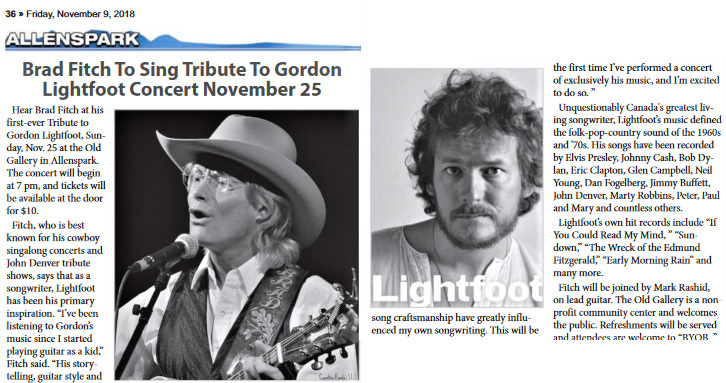 I often include a few of his songs in my other performances, but this one is all about John Denver,” Fitch said. The popular Estes Park singer-songwriter has been doing the tribute concerts since 2004. “It started several years after [Denver’s] death when several friends encouraged me to put together a tribute to him,” he said. “I bear a superficial resemblance to Denver, and therefore have had folks asking me to play his songs for many years. The more songs I learned and the more I learned about Denver and his contributions to our popular culture, the more amazed I became. Fitch will be joined at the concert by renowned fiddler Johnny Neill, star of stage and screen, who has performed with Willie Nelson among others. This is his ninth year performing this concert with the band. The drummer will be Estes Park resident and “percussionist extraordinaire” Ward Durrett, who’s been with Fitch since 2011. Melinda Morris, Fitch’s sister, will be singing harmonies and his nephew, Eamonn Morris of Boulder, who is 19 years of age and “a monster musician,” will also be part of the band. Fitch’s brother Doug, who lives in Hawaii, will be playing percussion and singing harmonies. About half-way through the set, the band takes a few songs off and Fitch plays solo, the way Denver often did in his concerts. Fitch recently released a new CD, “Rocky,” an authorized Rocky Mountain National Park Centennial product. The album celebrates the park’s 100th birthday in 2015. He was also commissioned by the park’s centennial committee to write a centennial theme song, which will be introduced at the kick-off event in September. 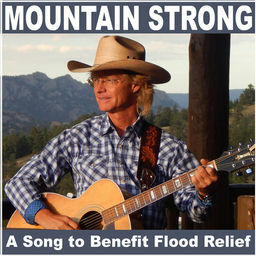 He also has a new John Denver tribute album, which has the artist covering 14 songs. “I am proud of this album as I feel it is my way of helping to keep his music, memory and messages alive,” Fitch said. The musician also presents his fifth annual “Spirituality of John Denver” concert at Hyde Memorial Chapel, YMCA of the Rockies, Estes Park, Aug. 24 at 7 p.m. The John Denver Tribute Concert takes place at the new Events Center at the Fairgrounds at Stanley Park, 1209 Manford Ave. 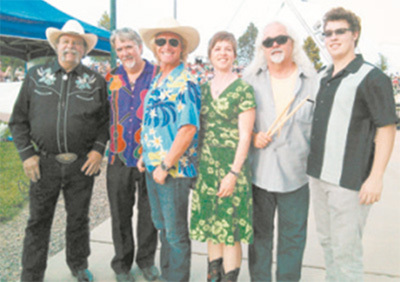 Doors open and Chain Station takes the stage at 5 p.m. Fitch and the TropiCowboy Band perform at 7 p.m. Advance General Admission tickets are available for $20 online or in Estes Park at Macdonald Book Shop, Hobert Office Services and at the Estes Park Visitor Center. General Admission tickets may also be purchased at the fairgrounds gate beginning at 4 p.m. the day of the event for $25. General Admission seating is first-come, first-choice, so attendees are encouraged to arrive early. Steamboat Springs — The influence of John Denver on Cowboy Brad Fitch was evident early on. The singer and songwriter from Estes Park has been playing music since he was 15 years old. When his high school band, Fitch and Chips, played shows, one request always was repeated. 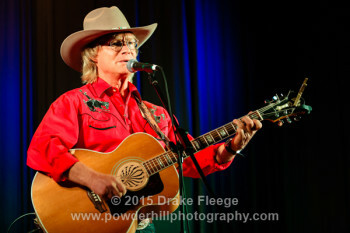 Fitch will bring his John Denver tribute show to the Chief Theater on Friday and Saturday. Doors open at 6:30 p.m. with the show set for 7 p.m. Tickets are $15 and available at All That Jazz or at the door. 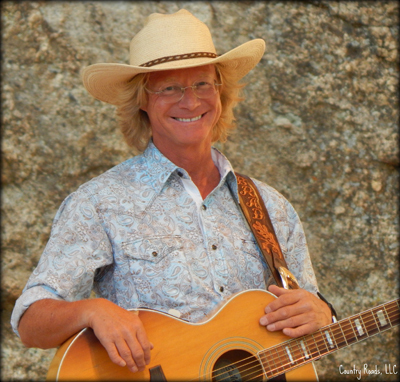 Fitch, who tours and plays mostly his own music, first did the John Denver tribute show in 2004 at the request of several friends and professional acquaintances. He did the first one in Estes Park at an outdoor venue that accommodated 500 people. The day of the performance, more than 1,200 people showed up. 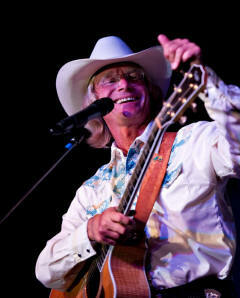 Fitch also did John Denver tribute concerts in Steamboat in 2005 and 2006 at Steamboat Mountain Theater. Fitch said he’ll play most of Denver’s most notable songs as well as many people may not have heard. In between songs, he’ll talk about the music and who John Denver was. Saturday also marks the 16th anniversary of Denver’s death. In 1997, Denver was killed at age 53 when his plane crashed into the Pacific Ocean. Fitch was able to see Denver in concert multiple times, including several shows at Red Rocks. He’s read as much as he can about Denver and looked at old video of his concerts. Fitch will play Friday and Saturday’s shows as a soloist, something he said sticks out in his mind about a Denver concert years ago. Copyright 2013 Colorado Life Magazine. All rights reserved. Used by permission.